HACKWORTH: A long-time popular variety that most likely originated with Dr. Nichodemus Hackworth (1816-1893) of Morgan County, Alabama. A letter sent to the USDA by T.W. Dermington of Lavonia, Georgia, in 1907 stated that the apple arose as a chance seedling on a creek bank from seeds washed down from an old orchard upstream. It is believed that Dr. Nichodemus obtained starts from this original tree. 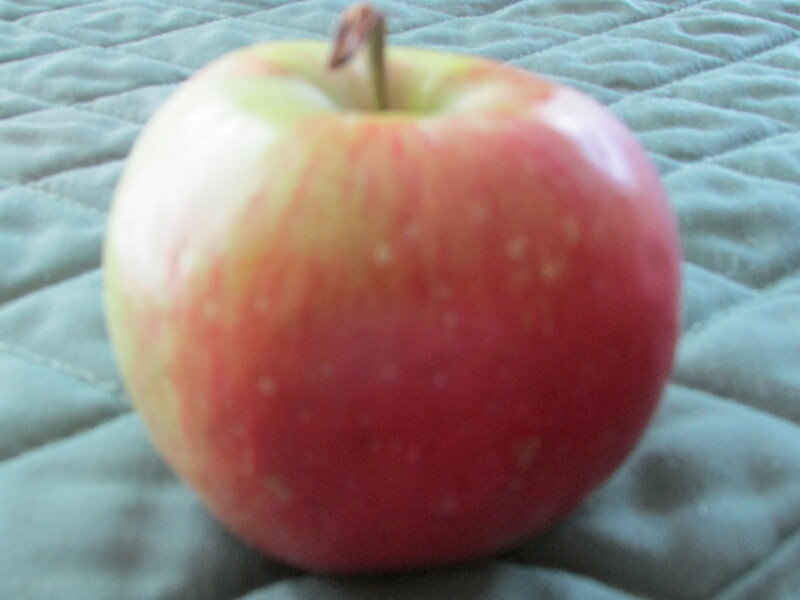 As described in an old nursery catalog, it was a great summer apple which “bears fruit every day in August.” Fruit medium with yellow skin overlaid with a few red stripes and splashes. Flesh is yellow, granular, and aromatic. Ripens July to August. Hackworth is an heirloom variety of apple that my mother remembers from her days as a child in Cullman County, Alabama. She speaks fondly of one particular place that her family lived in the community of Jones Chapel. This was in the days when my grandfather was farming in Cullman County, before the family moved to Birmingham and he began factory work. Mother often talks about the fruit orchards and grapevines on this particular property. They took such a place for granted back then; it sounds paradisiacal to me. A few years ago when we were at the Saturday morning Pepper Place Market in Birmingham, Mother was excited to see Hackworths at one of the stands. She bought some and said they had been a favorite of hers as a child. She told me to get her some Hackworths if ever I happened to run across them. Since that one time at Pepper Place I have looked for but have never been able to find Hackworths again. Over the years I inquired about Hackworths at Pepper Place and other farmers’ markets and farm stands, did searches, and called places that might be able to help me. I’ve even driven the back roads a few times seeking out orchards that I was told about that might have potential. Each path was a dead end. Over time I gave up. I would occasionally ask somebody if they knew anything about Hackworths and was generally met with blank stares. A few weeks ago after a trip to Birmingham I remembered that Hackworths had been a summer apple and did one more half-hearted on-line search, not really expecting anything of substance to pop up. That’s when I found the website for Big Horse Creek Farm in North Carolina, in high country near the place where North Carolina, Virginia, and Tennessee meet. I did a search for Hackworths and ran across the entry that begins this essay. The site indicated that Big Horse Creek Farm specializes in antique and heirloom apple trees and provides specialty services to graft trees for customers looking for specific heirloom varieties. Finally, a ray of hope. I sent an email to the nursery, told them of Mother’s fondness for Hackworths and how I had been trying to track some down for years, and asked if they might know where I could find Hackworth apples for purchase. I received a nice reply from the nursery’’s owners, Suzanne and Ron Joyner, telling me that they had just picked a couple of bushels from their one Hackworth tree on the previous day and would be selling them at a farmers market the following day. Since I was in Alabama I would not be able to get to their farmers market but I thanked them for their reply. Almost as an afterthought, I added “Do you ship?” Based on the nature of their business, I was certain that they did not ship fresh apples, only trees. A couple of days later I received a reply. It began “We are a small specialty nursery operation and don’t normally ship fresh apples but here’s what we can do…” They had been touched by my mother’s request and suddenly, after years of searching, I arranged to have ten pounds of the elusive Hackworth apple shipped to my parents’ house. The shipment arrived on Friday. I traveled down to Birmingham the next day and was eager to bite into one of the long sought-after apples. The Joyners included a note to Mother explaining that they sent some slightly underripe fruits to ensure safer shipping and longevity. The apples are small to medium-sized, ruddy, and randomly marked with green and gold accents; they have a firm fresh real apple taste with a semi-tart bite. They’re full of possibilities. It’s easy to see how one would remember them all of her life. I always feel fortunate when I discover kind-hearted and caring people like the Joyners who are truly and quietly making a difference. Their mission is to preserve a part of our horticultural heritage. In so doing, I think they plant hope. In the case of my mother, they made a distant memory real again. This entry was posted in Hackworth apples and tagged antique and heirloom apple trees, Big Horse Creek Farm, Hackworth apples, Lansing North Carolina, Ron and Suzanne Joyner on August 24, 2015 by gedwardjourney. 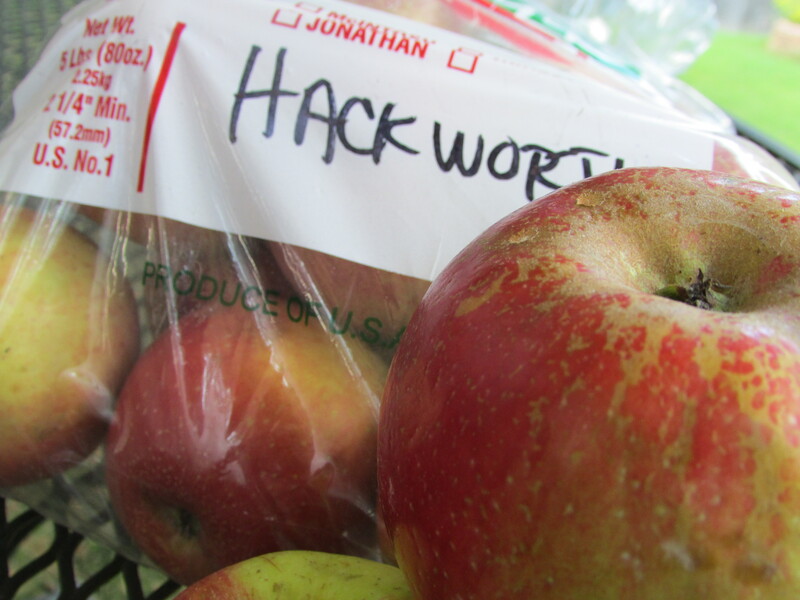 I just read your article about Hackworth Apples. We live in the Palmerdale-Pinson area and have a couple of Hackworth trees. We did not know what type apple they were until a gentleman pulled into our driveway and asked if he could pick a few for his grandmother. She knew the previous owner of our property and picked them for many years…. This is such a precious post, Ms. Franks. Thank you so much. I might ask to pick some of your Hackworths myself. They bring back such happy memories for my mother and are so hard to find. She still says it’s her favorite apple ever.